This has been the year of experimenting with filled chocolates. Over the last few months I have tried four more fillings so I have a few to write up. to you. The one I will share today is another peppermint filling. But whereas the last one was creamy with mostly icing sugar, these are far more healthy and nubbly with coconut, cashews and coconut oil. I haven't had good experiences with coconut oil. It has tasted too much of coconut when I have used it previously. Yet I know many people are huge fans. I finally went into WholeFoods in East Brunswick and talked to a nice man there who explained to me how extra virgin had less of a coconut taste. He even showed me that difference in colour between the virgin and extra virgin. 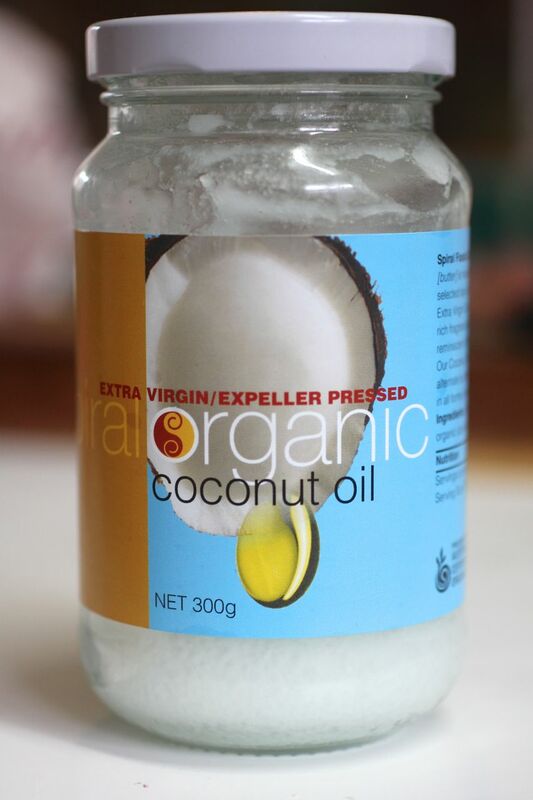 I have found this one more pleasing so maybe there will be more recipes with coconut oil here. Not that it has been an easy ride even with this coconut oil. I tried this mint filling and the coconut oil pooled at the bottom of the blender. Not only did most of the oil leach out but quite a lot of the flavour went into the oil. (We made some dodgy energy balls with the oil that refused to integrate!) Despite this I still ate the leftover filling straight from the bowl because it was so good. And healthy. Right? 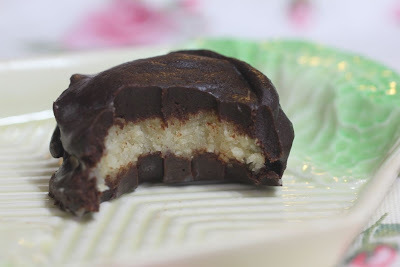 The recipe for chocolate mint patties that I had seen on Pinterest came from This Rawesome Vegan Life. Em had made her own chocolate to cover them. I decided to just melt regular dark chocolate and use my moulds to fill them rather than dipping the patties in chocolate. It fitted in well around soaking chickpeas, a trip to the library and was ready in time for a puppet show. When I made the other peppermint chocolates, someone commented on the chocolate looking good. They spoke too soon. This chocolate was good on the day I made it. 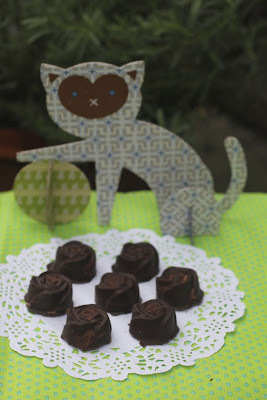 The next day I took photos (with a cute DIY cat that Sylvia was given as a party favour at a kids party) and the chocolate was not quite right. The day after a friend dropped in and I proudly gave her one of the last chocolates, only to find the chocolate was virtually inedible and crumbly. Argh! Since then I have looked up tempering chocolate a bit and my method of making it in the microwave seems fine because it doesn't get too hot. I wonder if a bit of moisture got into the mixture and made it seize. Anyway, I got chocolate paranoia after the first batch. I decided to make the chocolate like Em did rather than risk melting regular chocolate. I made the patties into disks and dipped them in the homemade chocolate. I could have just eaten the bowlful of silky smooth chocolate. However I didn't melt the coconut oil first and it was rather thick. I foolishly microwaved it a little to see if that loosened it up but it just made it thicker and less glossy. The chocolate still tasted amazing around these patties, or dobbed on top of them as I did with the last two. By then there was no way I could dip and cover them. 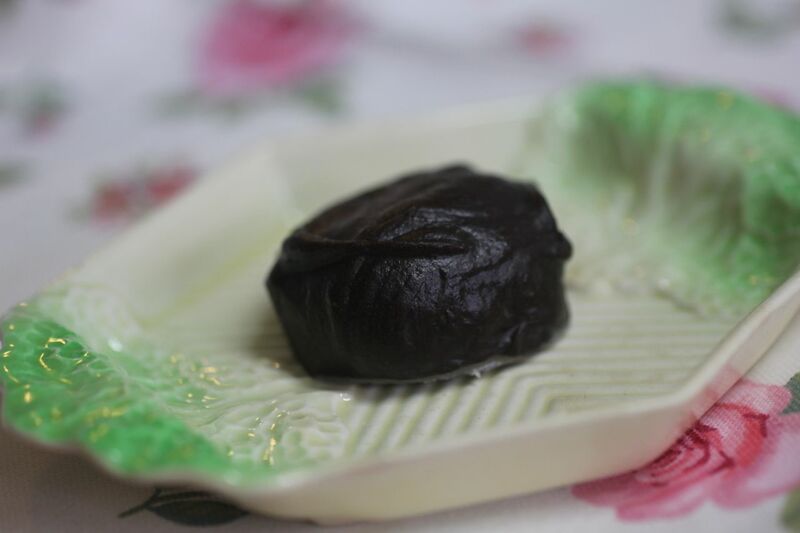 My next challenge is to try the homemade chocolate with melted coconut oil and try it in the chocolate moulds. As it was, the homemade chocolate was quite thick around the patties but delicious. I was pleased to give it a three day test (using great self control) and find it was better on the second day than the first because it was firmer and it still tasted great on the third day. I am sending these chocolates to Elizabeth of Elizabeth's Kitchen Diary for We Should Cocoa. The theme this month is truffles, chocolates and balls. I am also sending them to Ricki's Wellness Weekends. Blend coconut, cashews, maple syrup, peppermint essence and salt Add the coconut oil and blend briefly until incorporated. Use your hands to roll into 10-12 small patties, and place on baking paper on a baking tray or plate. Place in freezer to firm up. Make chocolate by blending all ingredients until smooth and shiny. Dip firm peppermint patties in chocolate mixture and place on baking paper. I left mine to set at room temperature and the 'chocolate' was better the next day. Our chocolates lasted well in the three days before they were gone. 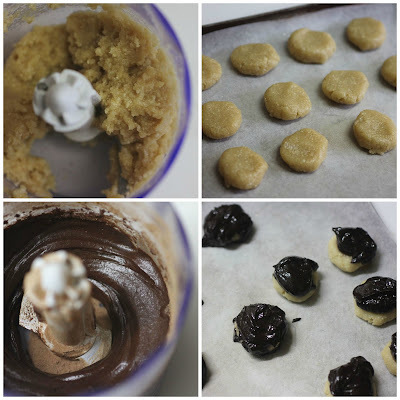 *Note: you can dip the chocolates in regular melted chocolate rather than making your own chocolate. These are very adventurous Johanna. Dipping with raw chocolate is a completely new one on me and something else I must try. I've had variable success with raw chocolate and have sometimes found the coconut oil has leached out the bottom and other times it's been fine. Anyway these sound delicious and I think I'd really like the texture of the filling with the cashew nuts and coconut - lovely. Thanks for adding them to this month's We Should Cocoa chocolate showcase. That's what cooking is all about, isn't it, adventures in the kitchen, trial and error, failures and success. What a lovely chocolate story! Your chocolates sound gorgeously healthy and delicious. I've never tried making my own chocolate from cocoa powder before; I ought to try your recipe sometime soon. Thank you for sharing with We Should Cocoa! You are such a trooper. Love how you keep making recipes until they're perfect. I'm usually bored by the time I'm finished a batch of something and want new flavours next time rather than perfecting the old! Sometimes as an after dinner snack Ill melt chocolate and dip apricots dried and strawberries fresh and pop them in the fridge or melt a couple of squares and drizzle on icecream. Im thinking I could make a peppermint filling keep it in the freezer and dip those. I find and this is purely for healthy weight reasons if I make sweets I try to make just enough for the time I feel like it and not make extras for afterwards. I put far too much weight on otherwise! Though I if I can freeze a mix like anzac biscuits and crumble topping this helps me in the convenience department but makes it harder for me to pig out on. Your chocolate look amazing the last batch of filling looks like peppermint patties yum! Sounds like with all of these experiments you are becoming quite the expert. I'm looking forward to the next chocolate instalment which were very impressive. I've had coconut oil in the pantry for a while but haven't been brave enough to use it yet as I'm wary of the flavour being too overpowering. Now I'm even more wary as I'm sure it's not a virgin coconut oil. You can't go wrong with chocolate and mint! And I love that you've done it raw! Would you come share this at Raw Foods Thursdays? Yesterday's linky is still open. We'd love to have you! 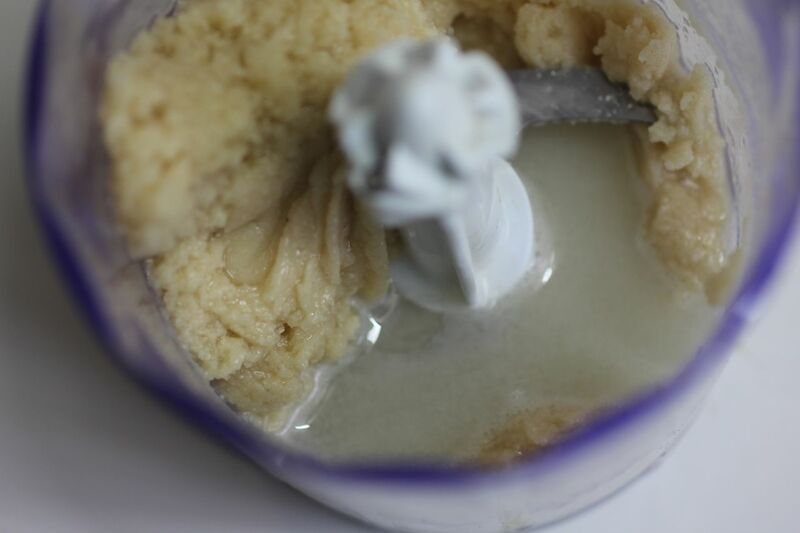 Sorry you've had bad experiences with coconut oil :( I love the stuff, especially as a thickener and for adding creaminess and richness to raw desserts. I'm a big fan of the chocolate-mint combination so I'm sure I'd love these. Phew, this sounds like quite the odyssey! I'm happy your chocolates turned out well eventually! I can relate to your issues with coconut oil. I usually just use very little oil and then it's fine, but when I use slightly more it tends to make me feel sick (same with coconut milk). Oh these sounds amazing! I can't believe how much you can do with coconut oil. But I am still a bit unsure about using it too, due to lack of experience! Great minds think alike Johanna! I made mint filled chocolates too. I had a sudden craving for them. Your version looks great! I jumped on the coconut oil bandwagon and now the jar is sitting in the cupboard and I'm a bit lost as to what to do with it. I don't have your patience with the chocolate so maybe I'll just make the filling!! I like that you are experimenting with chocolate making - I may be able to ride along behind you and learn from your lessons! There is something quite wonderful about making filled chocolates from scratch, and when they work, they are inevitably better than anything you can readily buy. These look lovely. Hi Johanna! I have just come into blog land for the first time in two months and got immediately distracted by this post. These look SO good, despite your woes in making them. I can just imagine how tempting the mixture was in the processor, I would have been in with a spoon too! 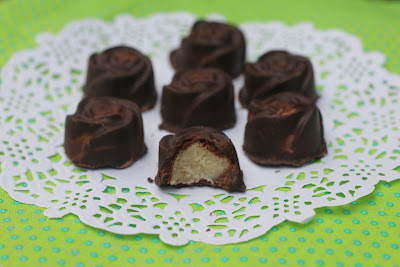 I do love peppermint chocolates, and I like the unusual way of making these. I have bought a few books on making chocolates this year and hope to make some as gifts at Christmas.